As you know my design boards have been lacking recently and I believe the last one I created for you was back in August 2013!! How shocking is that? In this time I’ve collected (designed is the right word here) a mountain of boards for my beautiful, and wondrous couples, so I decided to tweak them and post them so you can see what I’m working on and what is HOT for 2014!! This ‘Let’s Go Green’ board was created for a couple who are actually getting married next year, with a classic organic marquee garden design/theme. What do you think? 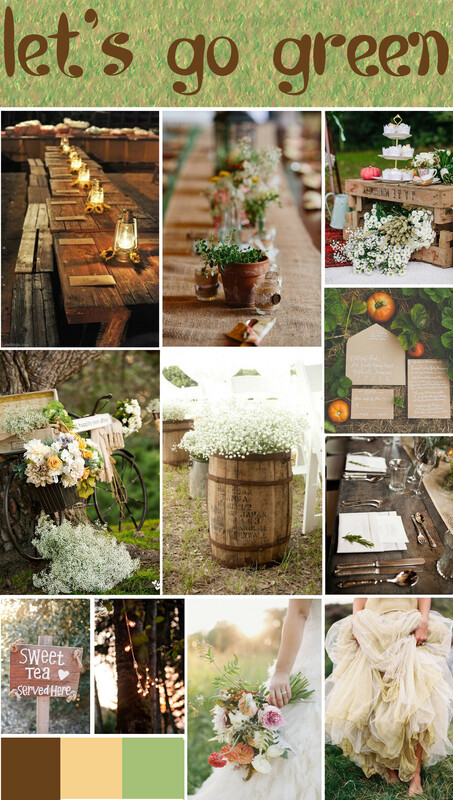 I love the organicness of it, especially the wooden rustic tables, which I totally in love with at the moment!! Thanks again to the people above; you’ll also notice me up there!! That’s right, I created that photo shoot, whoop whoop. Anyway, thanks for popping by and I hope this has inspired y’all? I think ending with the word peace works with the whole green theme, so peace up everyone.